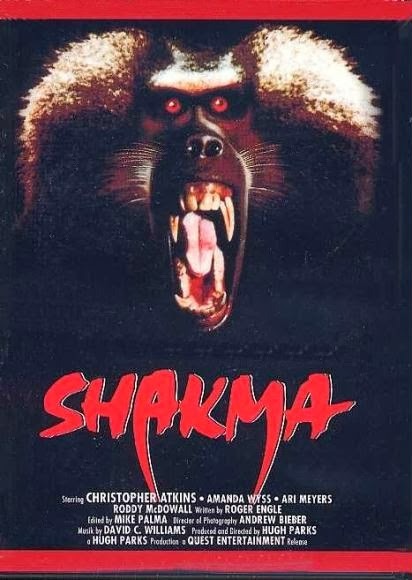 Shakma deals with one VERY irate baboon who tears through an entire laboratory staff after he awakens from a failed medical experiment. Veteran actor Roddy McDowall (Planet of the Apes series) find himself being chased by an ape instead of playing one for a change in this paycheck film. Has beens Christopher Atkins (The Blue Lagoon) and Ari Meyers (Kate & Allie) wander through the same looking sets over and over in a desperate search for an exit to this nonsense. This barrel of monkeys is currently streaming Netflix and Amazon Instant Video, but as always, you're better off just throwing feces our way and listening to the show. Our special guests this time out our Arthur Harkness and Martian Luthor Kang from the Brotherhood of Evil Geeks collective. Their website, EvilGeeks.com, showcases all the latest geek related news in movies, TV, games, and comics. They also host not one, but two podcasts for your listening enjoyment.